Happy New Year! 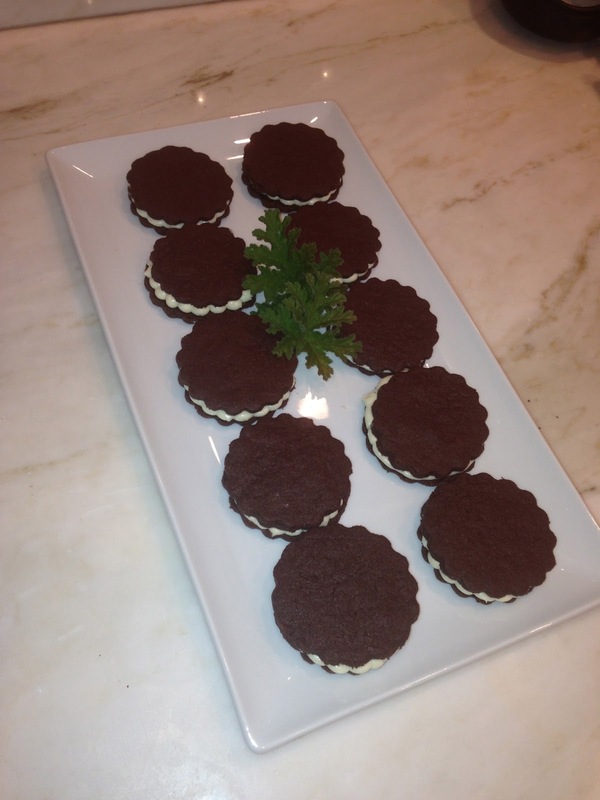 Our first recipe of the new year is Thomas Keller's version of another childhood classic- Oreos. Once again, TK has elevated the treat we all know and love to a more refined, elegant version. This recipe called for some specialized ingredients, so our team worked together to find and share them. The most unique ingredient was cocoa noir, or black cocoa powder. It's much darker and more bitter than most cocoa powders, but it really made a difference in the color and taste. Most of our bakers had a hard time with the same techniques, such as the white chocolate ganache filling and rolling out the dough thinly. It's encouraging when you find out others have had the same issues, that it's just not you. Overall, our bakers agreed that these were delicious cookies, despite the difficulties in the baking process. The list of ingredients for the TKOs was short, but with New Year's falling on the same week; I had to mix the dough one day, bake the shortbread as well as making the filling on the second day and assemble the TKOs on a third day. I had difficulty rolling out my dough in between plastic wrap or parchment paper, my dough crumbled. I had to push it back together and refrigerate. The second time around I rolled it out with my rolling pin on a silicone rolling mat with no problems. When making the filling it did not appear to look white, I thought that maybe it was due to the chocolate I selected; but then after mixing it in the stand mixer, it turned white! I was not able to pipe "tear drops" so I did the next best thing, smeared a layer of filling on the shortbread; so that I could go out for my morning run. I was able to make 16 cookies or 8 TKOs, but only had enough filling for 5 sandwiches due to my improvisation. In future recipes I am going to use less salt- I feel the cookies I've made have been on the saltier side for my taste. Thanks to Tania for researching where to purchase the Guittard Cocoa Noir and to Leticia for driving to Berkeley to purchase it, so we could all use. Yield 9 three inch cookie sandwiches and 18 2 inch cookie sandwiches. I was excited to make this recipe, but it wasn't without some challenges. This time, I read the recipe thoroughly before beginning. While this recipe seemed less time consuming than the Better Nutter, I noticed that it called for a special dark cocoa powder, cocoa noir. I called around to a few specialty cake supply shops, and located it at Spun Sugar in Berkeley. Leticia was kind enough to go get it, and brought it in for everyone to share. Team work! I also picked up the recommended chocolate for the filling, Valrhona 35% white chocolate. I used Strauss organic European-style butter again. I made the filling the night before I planned to make the cookies. It's essentially a ganache, which I've made many times. So I made the ganache no problem, and popped it in the fridge overnight. The next day I made the dough. It's a chocolate shortbread, using the super dark cocoa powder. Man, it was really almost black! I have never seen such dark cocoa before. The dough came together well, and was quite crumbly. I divided it into two portions, since I had a hard time rolling out the previous dough on my tiny counter top. That turned out to be a great idea. After chilling for a few hours, I was ready to roll! I used an adjustable rolling pin, and was able to roll the dough quite thin. It was difficult to get started, since the dough was so cold, but after a while it got easier. I re-rolled the scraps a few times. I was able to get 18 3 inch rounds, and 36 2 inch rounds. Plus, I baked off the remaining scraps for crumbs later. The larger cookies baked for 16 minutes in a 325 degree standard oven, and the smaller for 10 minutes. After the cookies cooled, I was ready to frost and sandwich them. I took the ganache out of the fridge and put it in the mixer, as directed. After a few minutes of beating on low, the ganache broke. It was gross looking, grainy and oily and not fun. I got frustrated, but the internet was there to help! Either I got water in it or it was too cold. The recipe did not say to bring it to room temp, so I was confused. So I re-heated the ganache over simmering water, until it melted again, and then let it chill slightly before beating it in the mixer. Success! I piped the now beautiful ganache on the cookies with a Wilton 12 tip, but ran out and have 8 mini cookies with no filling. I tried TK's teardrop technique, which was pretty, but also tried a few variations, which look more like Oreos. Taste: just like Oreos! Although the dough is a bit saltier I think the filling looks and tastes great. These would be perfect with a cold glass of milk. All in all, great recipe, and I learned a few things in the process. I used metric measurements and a standard oven for the cookies. This recipe made a lot of cookies; I lost count and was distracted, more on that later. I only filled about 10 of them with the white chocolate filling. Thomas said Knock You Out! 2. I had enough cookies filled to try and share to see how they tasted. the extra cookies with the leftover butter cream and wow were they amazing! in the tears may throw off the recipe. 5. I need to rethink my definition of fun! I once dined at Ad-Hoc and the dessert was a turtle ice cream pie with a crust made from TKOs. I asked the waitress what they were. She explained the cookie and that they made them to grind them up to make the crust. Wow, that is commitment! I don’t know how committed I am to make these cookies and then grind them up to be a base for another dessert. But I said I would do anything required in this book to further my baking education. I still remember that dessert at Ad-Hoc,4 years later and that is partly because of the care and craftsmanship that I know went into it. I will make these cookies again after my quest for the correct white chocolate is complete. After that I will look for Jimmy Hoffa’s remains and the Holy Grail! Yielded 3 cookies of the 3" and 20 of the 1.5"
When I was 10 years old, I had a taste of my first Oreo® cookie. I was in a play and had the part of Margaret Mitchell, author of Gone with the Wind. I don't recall why, but Oreos were given to us backstage. I was so happy eating them that I didn't pay attention that one person didn't get her portion of the cookies. I just ate and ate. Later, I found out that I had eaten her portion of the cookies. I can honestly say that eating the Oreo Cookies was my first guilty pleasure. The white chocolate filling seemed fairly easy to make, that is until after the four hour refrigeration point. I put the filling in the mixer bowl, it was smooth after the first few seconds in the stand mixer. I turned around for a moment and when I turned back the filling had broken up. I reheated it and cooled it for a few more hours, but the it never recovered. I made it again and failed two more times. I was on the verge of having a meltdown but decided to take a different route. I made a cream cheese filling instead, which worked out nicely. Making the cookies were easier than the Better Nutters. Instead of using 6 grams of salt, I used 3. Rolling out the dough was once again not an easy task. I used a chilled marble pastry slab along with a marble rolling pin which kept the dough cold. Despite these utensils, it was difficult to roll out already hardened dough. The dough crumbled, but I was pleased to see how easy it was to put it back together. Once I reached the 1/8" thickness I cut out six disks using a 3" biscuit cutter and for the rest of the dough I used a 1.5" biscuit cutter. I baked the six large disks for 14 minutes. The 1.5" cookies were baked for 8 minutes. I piped the cream using a 3/16" tip using the teardrop as instructed. This was my second time piping and found it is not as difficult as I thought it would be. I first tasted a cookie without the filling, which I was very pleased with and found they were not too far off from what an Oreo tastes like. The cream cheese filling is also very tasty with these cookies. I will definitely make these cookies again attempting the white chocolate filling. I hope someone can give me a few technique tips on making the filling. Easy enough recipe. I used the King Arthur Dark Cocoa that I already had. Have not made shortbread dough before so was a bit uncertain when the dough really didn't come together, rather crumbly. I continued on like I would have with pie dough. Made the mound of very crumbly dough, pressed into square and put in frig. After a few hours, I began the rolling out part. Wow, that was a bit of a challenge. Lucky for me, I have seen the pro's roll out shortbread dough before so knew it was going to be challenging. A great upper body work out for sure. Most of the dough rolled out fine, with parchment on the bottom and plastic wrap on top. I did notice though the edges crumbled quickly. At this point, I wasn't terribly motivated to do anything other than get some cookies cut out. Which I did using the fluted cutter. I think they are 3 inch. I cut 16 circles total for a total of 8 finished cookies. Also, made a whole lot of scraps which I have been nibbling on all night. No surprises. It took about 15 minutes total to bake. Easy to transfer to rack to cool. Back to filling. Not sure what was going to happen, I put runny filling in mixer and started beating with paddle attachment. Sure enough, it whipped into a nice fluffy filling. I took a very long breath of utter relief! I used the pipping bag that I had, with a fluted tip. Not being much of a cake decorated, I just went to town and started piping the filling on. Results are shown. Another over the top cookie. I might make this recipe again, but think I liked the short bread part of the recipe best. Not sure that I would go through the trouble with filling again, as it wasn't a TKO for me. I loved Leticia's take, using a cream cheese filing. I thought that was outstanding. I'll admit for this recipe I did not have the best ingredients, especially those white chocolate chips (ack!) so if you are not able to find the exact items or are price sensitive, do know they turn out fine. That is one of the things I love about doing this project. It allows us to see how recipes are done using different ingredients and so far everyone's results have looked and tasted great. The preparation of this recipe is similar to the Better Nutter but a bit easier to execute. The chocolate sable dough is drier and thus more manageable when rolling out very thin. The filling is a simple ganache but do note, it needs to become firm which can take 4+ hours. I really love this cookie. It is not anything like an Oreo besides the look of it. The cookie itself is a rich and chocolatey. The sweetness from the white chocolate is mellowed a bit with the addition of the cream and butter making for a really nice filling. When eaten together, you get the sweetness from the filling and then at the end a punch of salt from the cookie which I really like. More and more I'm appreciating the use of salt in baking as I make my way through this book. Thomas Keller does not skimp on it and it always makes the results that much better. Thank you Genia! Your TKOs look beautiful and we can't wait to see more. Happy Baking. I just got this cook book, and the recipes all look amazing. I decided to try out the tko's first today, but I was having problems with the filing coming out to runny. How long did you whip yours and so you have any suggestions? Thank you! Ainsley- we all had problems with the filling. 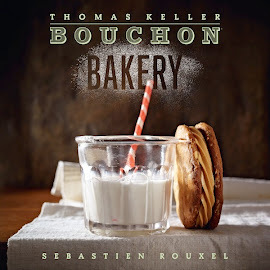 When we visited the bakery in Yountville, we asked the pastry chef about it, and her technique was slightly different from that in the book. The ganache shouldn't be totally cold before whipping, or it will break. Let it come almost to room temp before putting it in your mixer, then whip it until smooth. If it breaks at first, keep beating it on high and it should come back together. Good luck!